"Kaseya BMS is a next-generation business management solution "
Great IT project management system that is accessible from anywhere. That the product is only cloud based and we cant install a onprem solution. Have our team work on IT projects together. "Okay for what it is. There are better products"
This is a great ticketing and CRM tool. I like using tickets and projects and they are pretty straight forward and easy to use. This has made administration of tickets easier and helps us keep track of our projects better. Before we used spread sheets and emails to keep track of our tickets, with Kaseya BMS we have been able to keep much better track of the things we need to do. We also have been missing less steps and tasks by using this product. Hardly any training. This makes learning how to use the program difficult. Was pretty much thrown into it. Picked it up fairly quickly though it would have been nice to have training. There are a lot of features we never have used just because we do not know what to do with them. "Kaseya BMS Helped Jump Start our Business"
BMS has simplified our business processes as a fully functional PSA which integrates with our entire tool set. As a start up the benefits are incredible. An all in one solution for service management, sales tracking, financial management, and human resources. The layout is refreshingly easy to use and understand. Customization and configuration is simple. The Professional services team from Kaseya really helps you to understand the ins and outs of the software. Enabling you to easily make adjustments at any time without any advanced programming or support. Kaseya BMS is a breath of fresh air for an MSP like us. Finally a product that truly understands what we do. BMS provides us more time to focus on taking care of our clientele, building our brand and training our staff. Spending less time on our PSA has been key when we had to move fast when it comes to jump-starting our client base. Not much to dislike. However, there is always room for improved customization on invoices, forms, etc. I would highly recommend considering BMS f you are looking for a single pane of glass for managing your clients, staff, expenses, and receivables that is affordable and easy to use. BMS saves us time and money when it comes to our workflows and processes. Integration is simple with Kaseya VSA, Ticketing, Customer Surveys and IT Glue. The built in CRM really helps an IT focused professional like myself keep track of customer relationshps and sales without losing focus on the work I do. "Plenium operates BMS initially for the ticketing part and its contribution in ITIL methodology"
We have been able to easily defer the levels of services contracted by our clients and thus adapted our way of managing priorities. The integrated management of the workflows allowed us to model the escalations as well as the customer alerts. The connection with Kaseya VSA allows us to recover the alerts resulting from the system monitoring and the list of assets associated with the clients. This allows a very fine analysis of the processing performed in ServiceDesk. there a lot of Tools you can use with BMS from other vendors. Very powerfull with BrightGauge for example. We have integrated the BrightGauge and customerthermometer tools very easily and benefited from an operational dashboard within minutes and simplified satisfactions surveys. The results were felt in less than three months with improved internal performance, and traceability of interventions exploitable in BI. The best thing about BMS is the intuitive interface. From configuration to everyday use, its by far the easiest CRM I've used. We manage a lot of inventory, and transferring between warehouses is kind of clunky. Stock quantities have to be adjusted on both sides manually. Efficiency is the main problem we're solving. Since it is so easy to use, our techs are completing the ticket creation and time entry process much faster. It also helps us with holding asset information. The user interface is easy to use and intuitive, it’s comparable with most browsers, its easy to get started without much insight. Workflows are clunky, auto- generated tickets don’t work as expected. If you are looking for a basic simple setup this is a good tool, it has some biult in reports but the adhoc reports can be complicated to se up. It works with kaseya VSA this allows us to better track tickets, contacts and projects. Its a great tool. 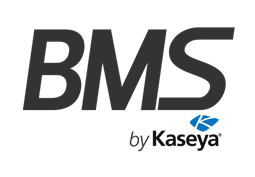 Compared to other CRMs I have used, Kaseya BMS is the most efficient. We are using Kaseya BMS for managing customers and tracking tickets. We were also looking for a cheap CRM which is a huge benefit. The easy of use to manage a business. Great Product. I don't dislike too much, Kaseya makes some great products. It gives the status of all our customers accounts. Allows tracking of inventory very well. Nothing, the product works as it should. Reducing cost and increasing productivity. The reporting can use some work. I hear they are fixing that though. * We monitor all Kaseya BMS reviews to prevent fraudulent reviews and keep review quality high. We do not post reviews by company employees or direct competitors. Validated reviews require the user to submit a screenshot of the product containing their user ID, in order to verify a user is an actual user of the product. Hi there! Are you looking to implement a solution like Kaseya BMS?